Oh my god I love this so much!! And now somebody is adopted. Ooo does that make lio and her sis adopted kids of hiccup? Ok, I'm old and no nothing about the way this site works. Is it possible to get a print of this image? This is fantastic! I am unfortunately not allowed to sell prints of this because of copyright and all, sorry ;v; But I really appreciate your kind words and interest! I agree ^^ I really love movies with unlikely friendships being made, plus I am a huge dragon lover XD The HTTYD movies are very dear to me. I would love to see lilo and stitch and httyd crossover. 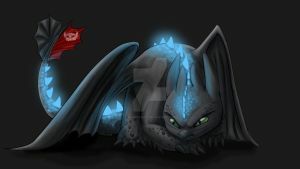 I'm not sure you know this, but the guy who designed Stitch also designed Toothless! It's funny how these two can be considered "half-brothers." Nice! I'm loving the emotion this picture gives, looks like they're about to fight somebody! Haha, that makes me happy ^^ Thanks! they look almost the same. Same thing I was going to say! They both are viewed and feared by many creatures, including their own but they bond with a human and in turn, show their cute and kind side.